This recipe puts a healthy spin on that mashed classic. Use turkey instead of greasy ground beef. Keep the onions and ketchup. Add some mashed potatoes and green beans, and you have a complete meal! In a large mixing bowl, combine ground turkey, onion, egg whites, salsa, oats, soup mix, and black pepper. Press mixture into 9x5 loaf pan and spread ketchup over top. Bake in preheated oven until meatloaf is no longer pink in the center and juice is clear, about 60 minutes. Approximately 25 minutes after putting the meatloaf in the oven, cut potatoes into one-inch chunks. Place cut potatoes in a large saucepan, cover with cold water, and bring to a boil over high heat. Reduce heat to medium and simmer until tender, about 20 minutes. Cut stems off green beans and place in a large saucepan with one inch of water in the bottom. Heat to boiling over high heat; reduce heat and simmer, uncovered, for 6-8 minutes or until crisp-tender; drain. Remove meatloaf from oven and let sit for five minutes before slicing. Drain the potatoes and return them to the pan. Mash while adding skim milk a little at a time. Add Butter Buds and mash vigorously until potatoes are light and fluffy. 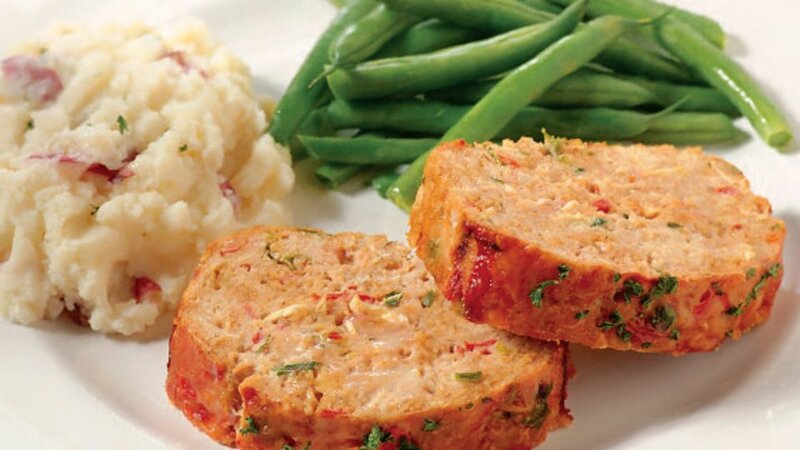 Place a portion of meatloaf and mashed potatoes along with about a cup of green beans on each plate. Serve and enjoy!